A sprig of fresh lavender atop boeuf bourguignon hints at the cafe’s French-inspired menu. WHO’S IN CHARGE The husband-wife team behind the freshly upscaled Allie’s Beach Street Cafe in Manchester-by-the-Sea are Glenn and Allie Varga. Allie has owned and operated the Pleasant Street Tea Company in Gloucester since 1987. Glenn worked for 20 years as a sommelier and server at the Four Seasons in Boston. For years, they searched locations for a new restaurant idea Glenn had in mind. “Customers told us to look at Manchester,” said Glenn. When the former Beach Street Cafe, a freestanding breakfast/lunch hangout on the harbor since the early 1980s, became available about a year ago, they jumped. After upgrading the breakfast/lunch menu, adding healthy spins on classic dishes, they added dinner. “It’s a bistro,” Glenn explained, “with a small ‘b.’” It’s not stuffy, more like an upscale diner, with moderate prices and a casual ambience, perfect for teens to older adults. THE LOCALE On weekends, long lines lead to this popular spot for breakfast and lunch. 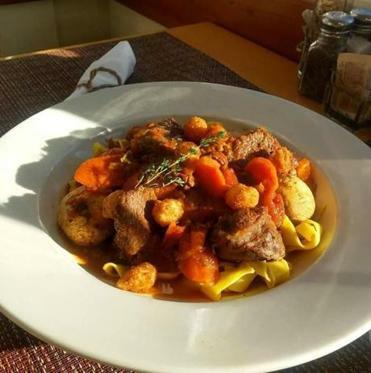 The 62-seat restaurant serves up to 350 customers on a Saturday or Sunday, including takeout at the four-seat counter for those heading to nearby Singing Beach in warm weather. Slowly, the word has been getting out about the French-influenced dinner menu that features slow-cooked, rustic dishes a la Julia Child, plus craft cocktails, a wine list, and a certified sommelier/owner to boot. Located between Manchester By the Book bookstore and Captain Dusty’s Ice Cream shop, the cafe is on a block featuring a high-end consignment shop, hardware store, and chic women’s clothing boutique. Boats sail in and out of the harbor during good weather. Whether to browse or eat first is the question. No, it is not. The new dinner menu, with something for everyone, includes many gluten-free and veggie options. We brought along our two daughters, ages 16 and 21. The 16-year-old debated between the Veggie Quinoa Bowl ($13), featuring a fresh vegetable of the day with kale and quinoa, and the Beach St. Smashburger ($12). She went for the tender pattie of ground chuck served on a bulkie roll with a “secret sauce #5” and skinny truffle fries. Both avocado-obsessed daughters swooned over the stuffed avocado ($12), its creamy insides scooped out, mixed with feta, spinach, and tomato stuffing, then restuffed and baked. Next time, we will order two. Dishes here play with textures, colors, and taste to tickle your senses. Case in point: the fried Camembert ($12), four lightly fried chunks of cheese with melting insides, topped with prosciutto crisps and spiked with toothpicks into crostini and balsamic glazed strawberries. Wintertime dishes like the steak frites ($26), a tender and moist marinated black Angus skirt steak, almost melt in your mouth. Wiener schnitzel ($19) was surprising to see on the menu outside of October, but Glenn said it’s a common dish in French bistros, often made with chicken or pork. Here, a crisp portion of moist veal paillard (pounded thin) was topped with sunny-side egg. Given Glenn’s wine expertise, there’s a hard-to-resist tasting menu ($30 for 3 courses, $45 with wine pairing) on Fridays and Saturdays from 5 to 9 p.m. A crisp, clean sauvignon blanc accompanied the starter, Coquilles St. Jacques, a filling sample of local scallops and mushrooms covered in a gratinee. Next up, rosé paired perfectly with a generously portioned, colorful beet and squash salad, dotted with goat cheese and tossed with a citrus vinaigrette. For the grand finale, cabernet ushered in boeuf bourguignon, tender chunks of wine-braised beef and vegetables on a bed of egg noodles, topped with crispy, fried pearl onions. All that was missing? Julia Child. Allie’s Beach Street Cafe, 35 Beach Street, Manchester-by-the-Sea, 978-704-9571, alliesbeachstreetcafe.com.